The German cockroach is known among entomologists as Blattella germanica -- but that is not likely what rolls off your tongue when you see the critters scurrying throughout your home. No doubt you wish they were confined to their namesake country but unfortunately they proliferate quite happily and robustly throughout the United States. According to entomologists, these undesirables likely hitchhiked their way here hundreds of years ago. Paradoxically, the German cockroach likely did not originate in Germany at all. Entomologists believe it originated in Southeast Asia and like all cockroaches, has been around for millions of years. Since the cockroaches can’t pen their historic travels, the best scholars of such things can do is theorize. One plausible theory is that the bugs hitchhiked with Marco Polo during the medieval period, or Middle Ages, as he traveled from his home in Venice, Italy to Asia. Polo departed in 1271 and stayed in Beijing for 17 years. He then spent a few years in Persia, arriving back in Venice around 1295 -- and if the scholars are correct, with stowaway cockroaches aboard to settle in Europe. Having conquered Europe, the German cockroach had to hitch a ride to what would eventually become the United States of America. It would be a few hundred years after Polo’s return that Christopher Columbus found his way to the Americas, giving the roaches plenty of time to propagate throughout Europe and make their way aboard one or more of those journeys. There were several other explorers after Columbus, though, so if the cockroaches missed one ship they had plenty to choose from. Juan Ponce de Leon was a likely host, and his timing corresponds with entomologists’ theories: The Spanish explorer, who accompanied Columbus on his second voyage, aimed for present-day Florida and disembarked there in 1513 -- possibly escorting cockroaches to the U.S. mainland. Arriving in the U.S. as Marco Polo's traveling companions is not the only theory explaining how this cockroach became Americanized, nor is its Asian heritage a certainty. Another plausible theory has the Blattella germanica originating from Africa. If true, the cockroaches had many opportunities to hijack slave ships en route to the U.S. from that continent, beginning some 300 years ago. Misnamed or not, the German cockroaches can host quite a family reunion either around the world or in the U.S., with approximately 3,500 species related to it. 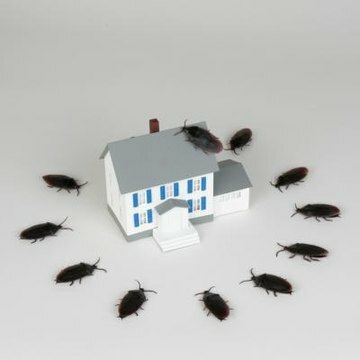 The U.S. hosts 55 species in all, but the German roaches have earned the distinction of ones you are most likely to see invade your home and most other dwellings -- at least if you live at or below 3,900 feet above sea level. If you live around or above 6,500 feet, or in a very cold dry climate, odds are you won't have a run-in with these undesirable bugs.